Prepare the white cake as directed, and allow to cool completely. Crumble into a large bowl with the frosting and Skittles, then combine by hand until thoroughly mixed. Roll into 1 1/2 inch balls and place on a baking sheet lined with wax paper. Freeze for 20 minutes. Melt 2 Tbsp of shortening in a double boiler over medium heat. Once the water is boiling in the bottom pot, remove from heat, add the orange candy melts and stir until completely melted. Remove the cake balls from the freezer and dip into the candy melts until coated, then place on a sheet of wax paper to set. While the cake balls are setting, Repeat the process with the last tablespoon of shortening and the chocolate candy melts, placing the melted chocolate into a small baggie with the corner just barely cut. 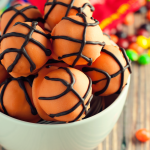 Allow to cool for several minutes, then drizzle over each cake ball to make a basketball pattern. Allow to set, then enjoy!